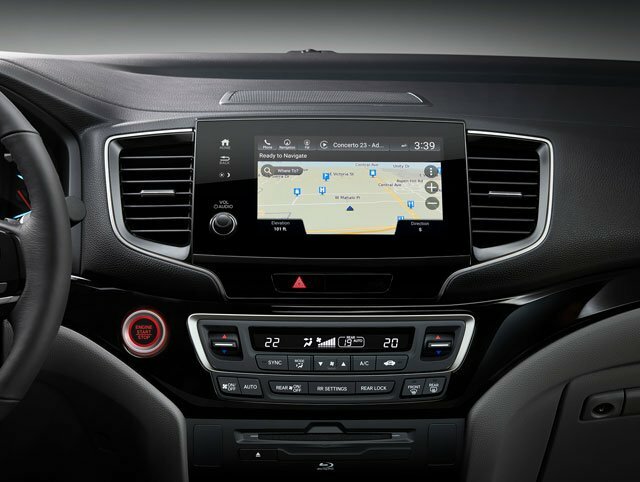 A sleek and ergonomic cabin is designed to keep the driver connected and in control. 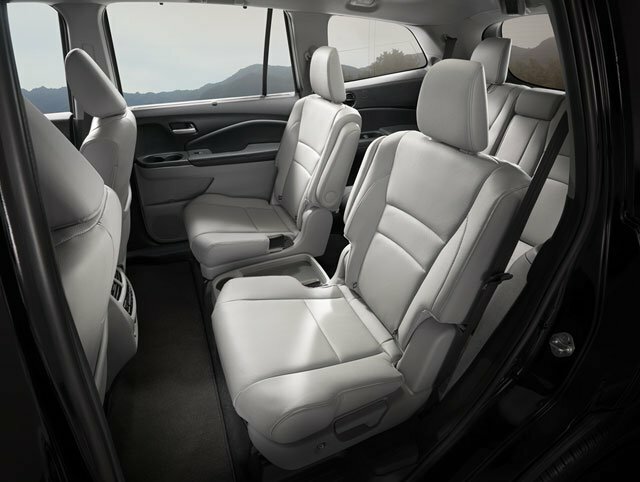 Inside, find a leather-trimmed interior with available 2nd-row captain’s chairs, and a third row that can be a configured for more cargo or seating. 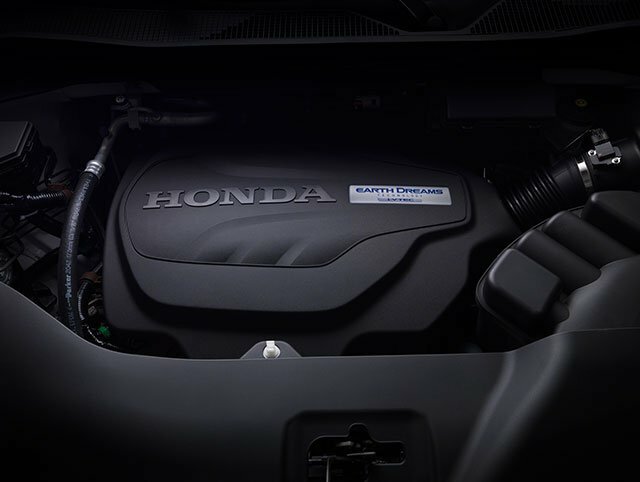 With up to 1179 liters of interior cargo volume, the possibilities are endless. 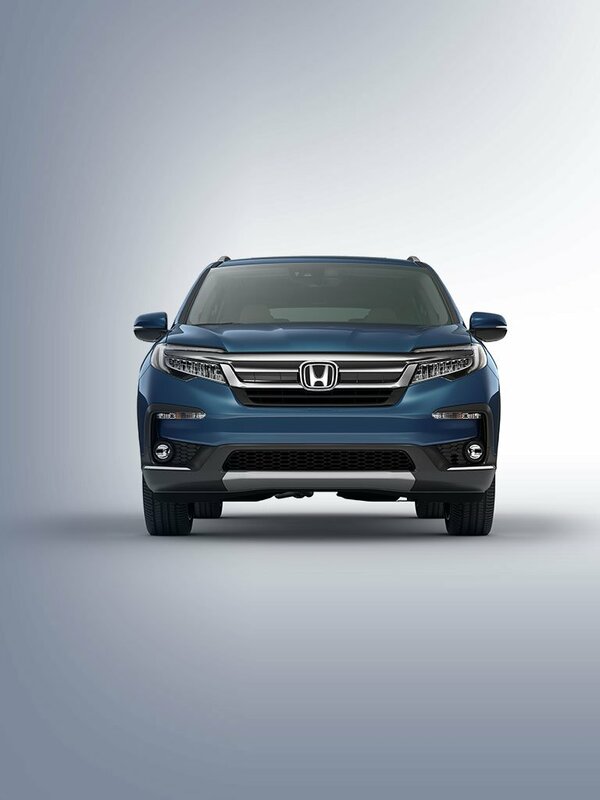 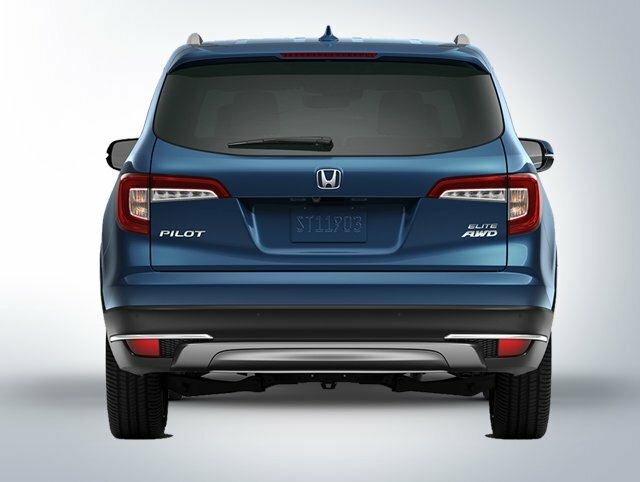 The aerodynamic lines of the Pilot’s upgraded exterior are highlighted by LED headlights and chrome detailing. 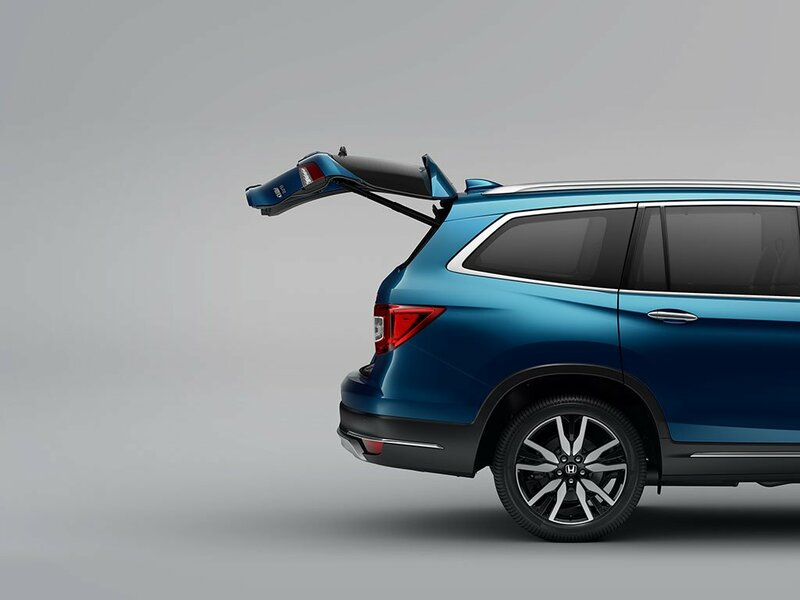 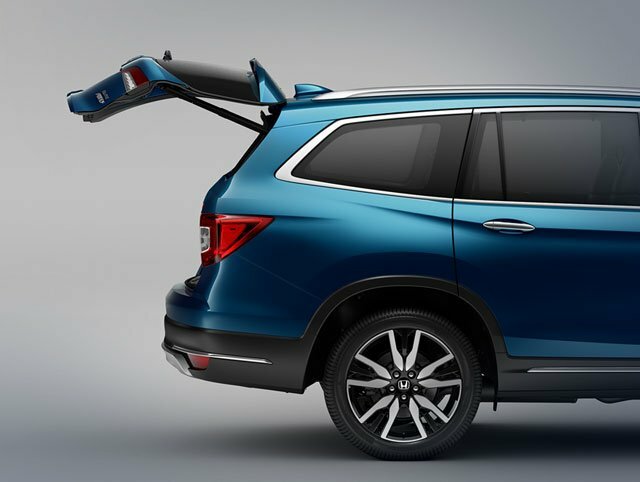 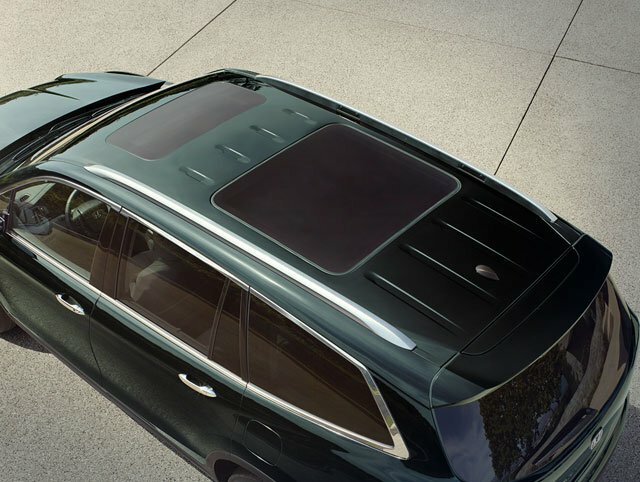 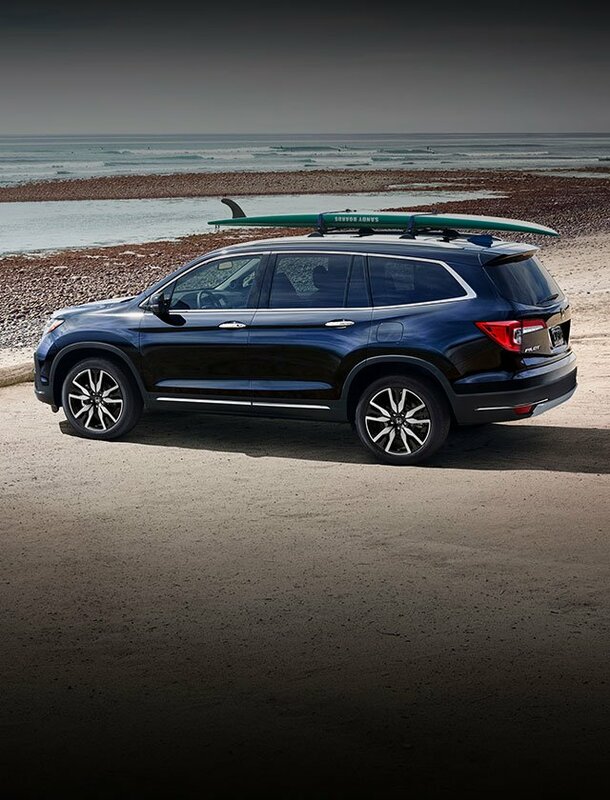 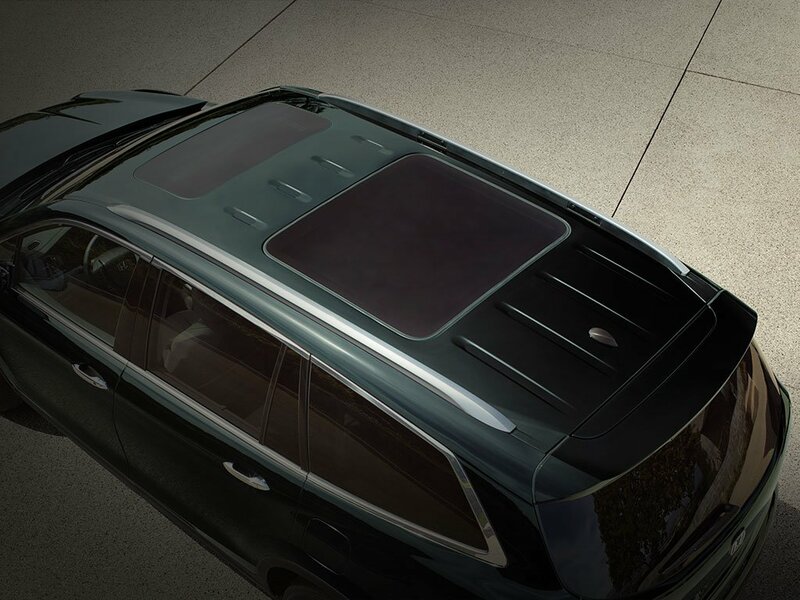 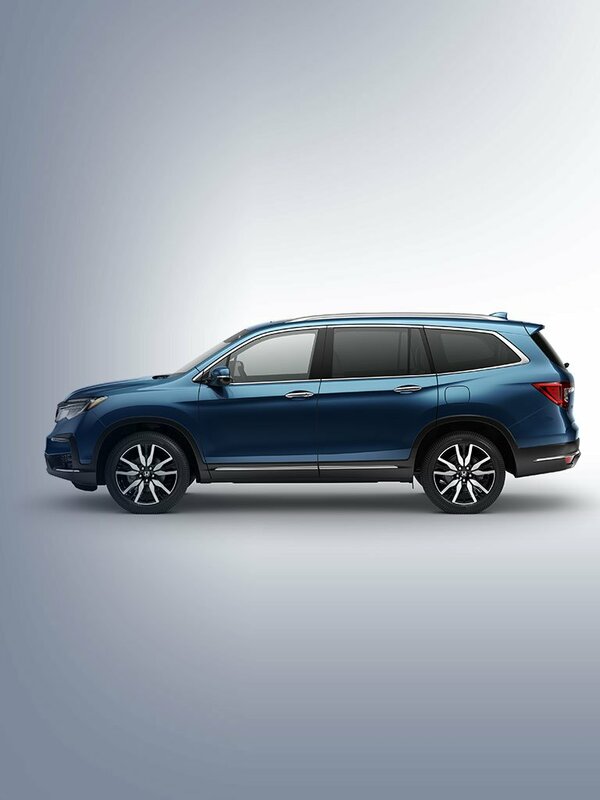 Adding stylish Honda Genuine Accessories* ensures your Honda Pilot is ready to go from mountain to sea. 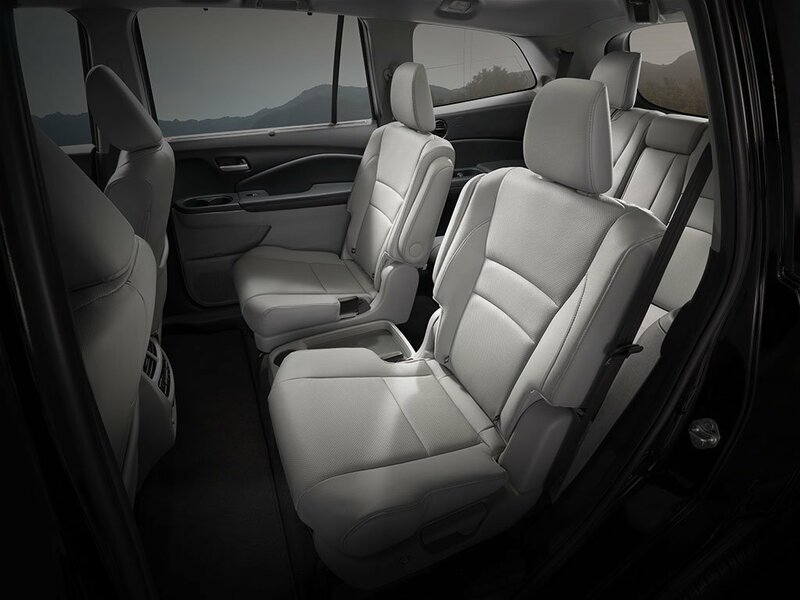 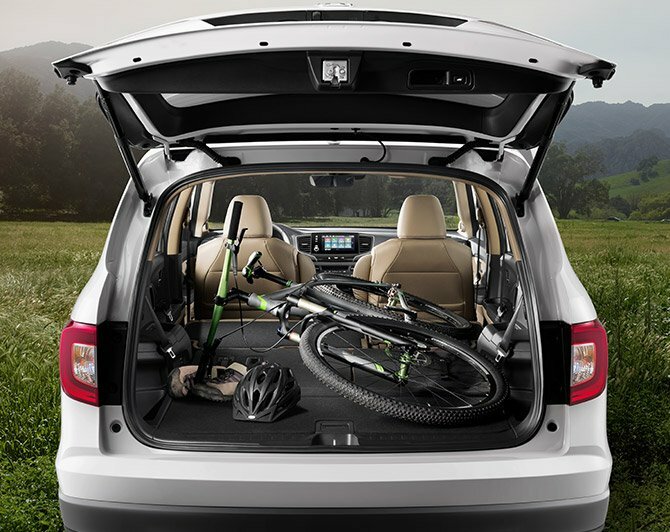 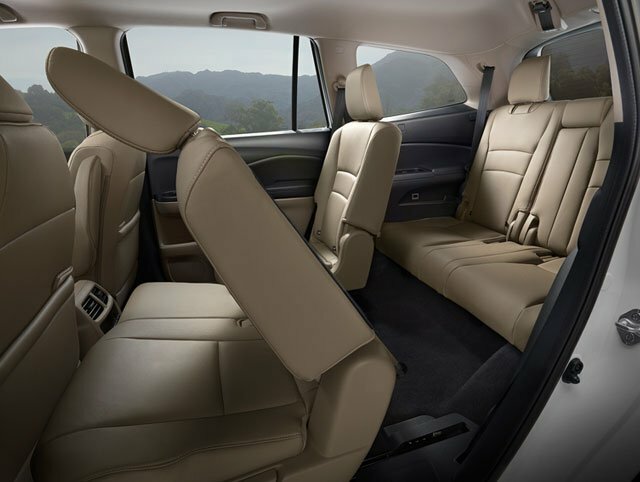 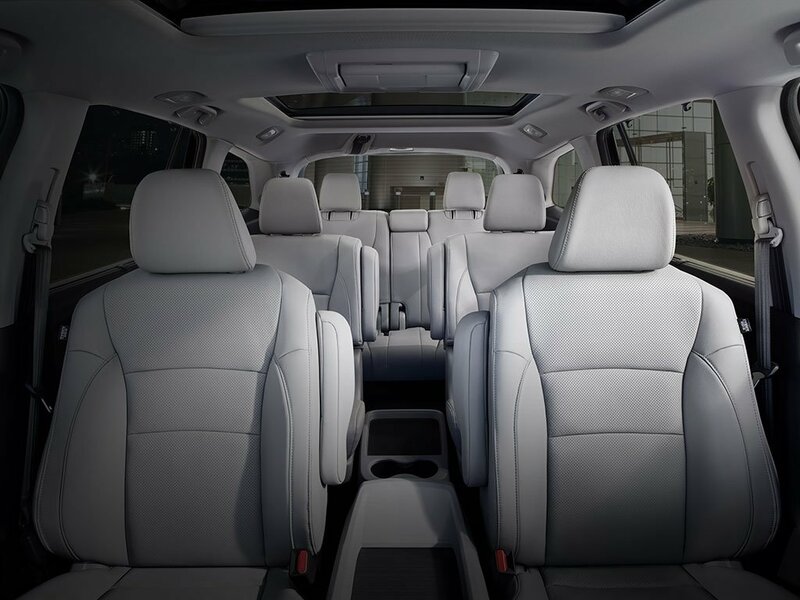 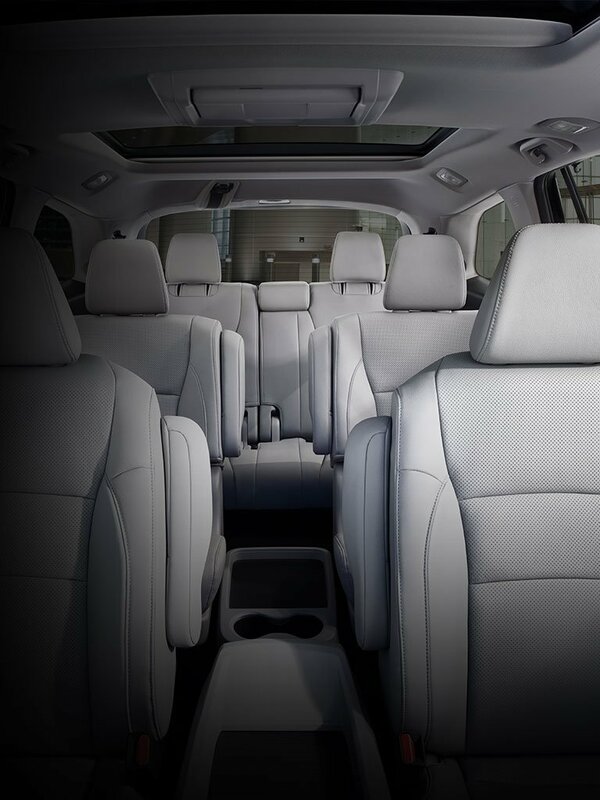 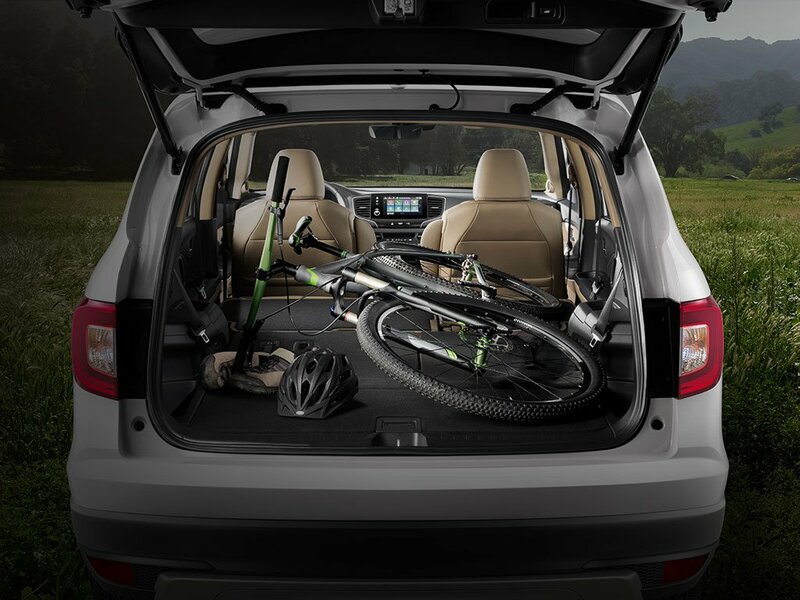 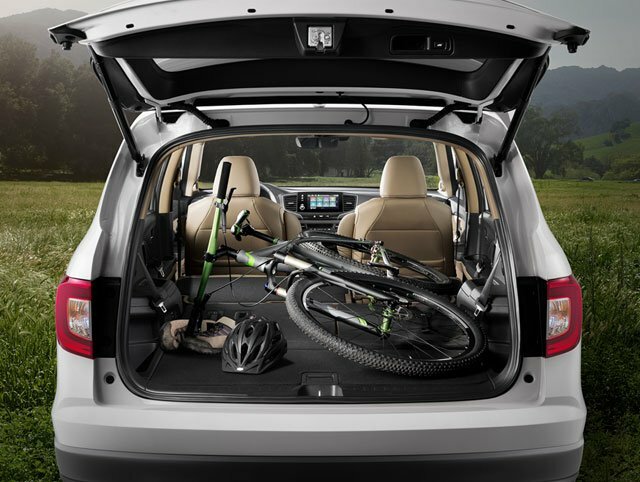 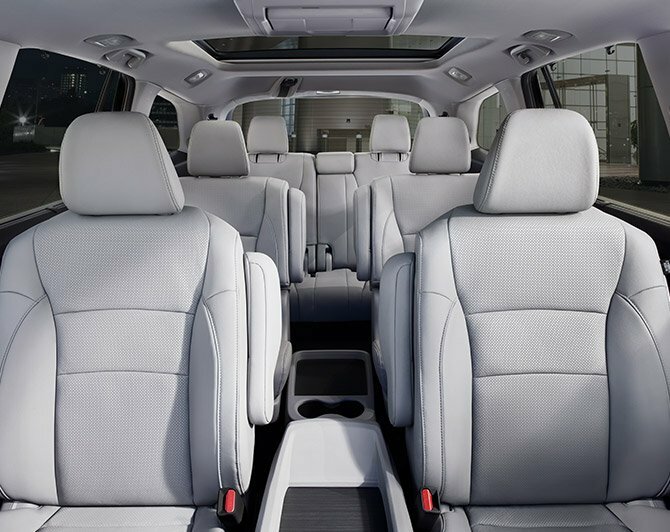 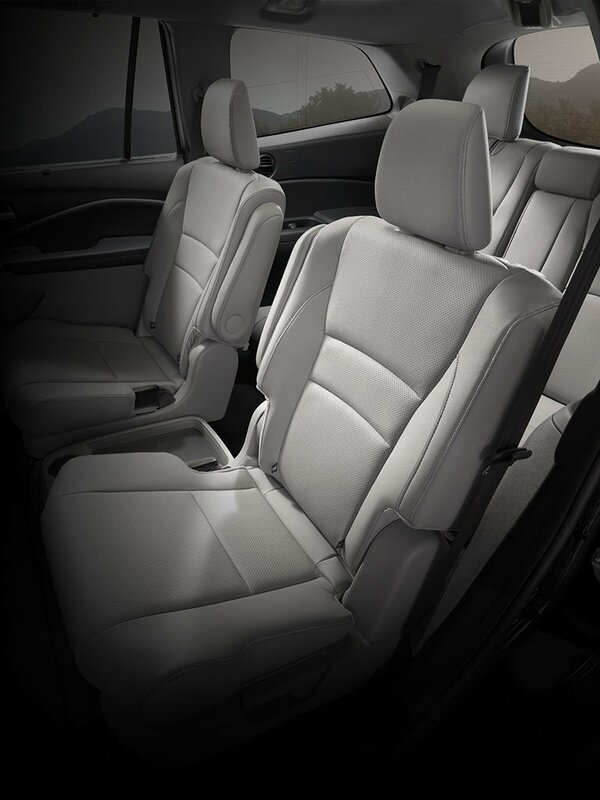 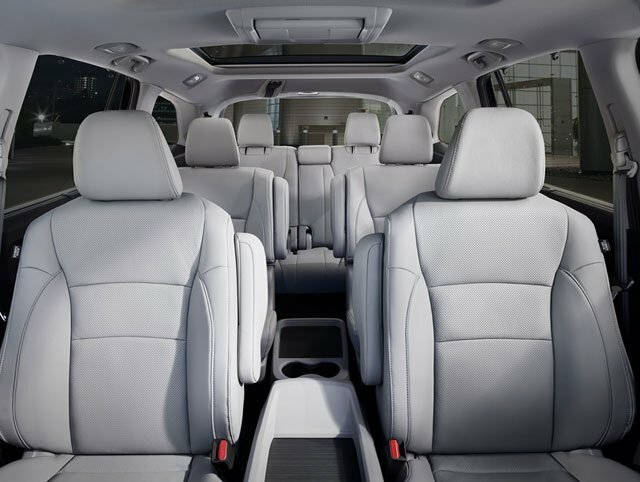 The Honda Pilot can seat up to eight and still have room for an 77 liter cooler* behind the third-row seat. 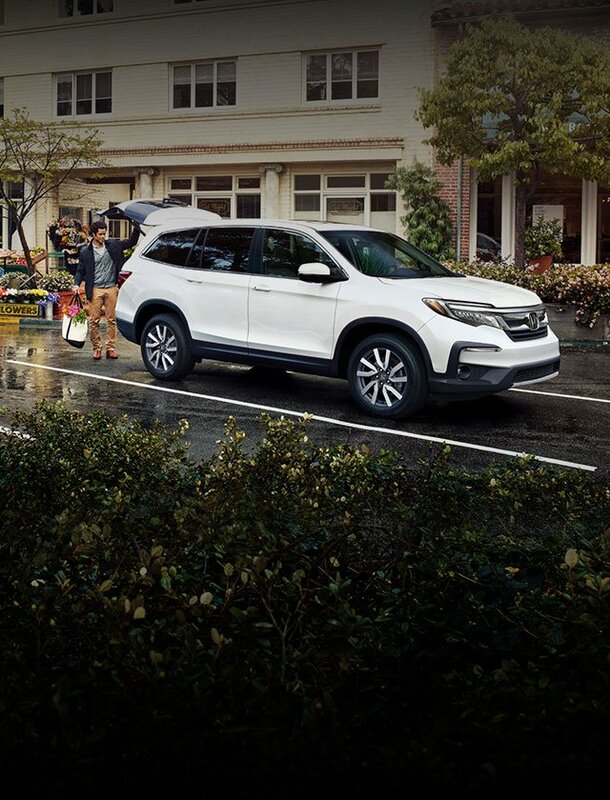 The versatile Pilot was designed for the modern family with places to be. 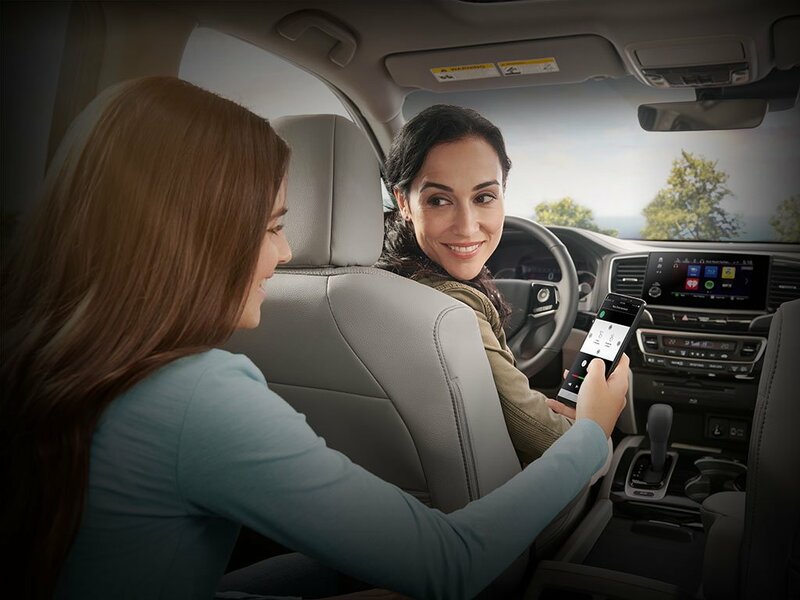 The modern Pilot is equipped with the available CabinControl, a smartphone app that gives rear-seat passengers the freedom to control audio and climate features. 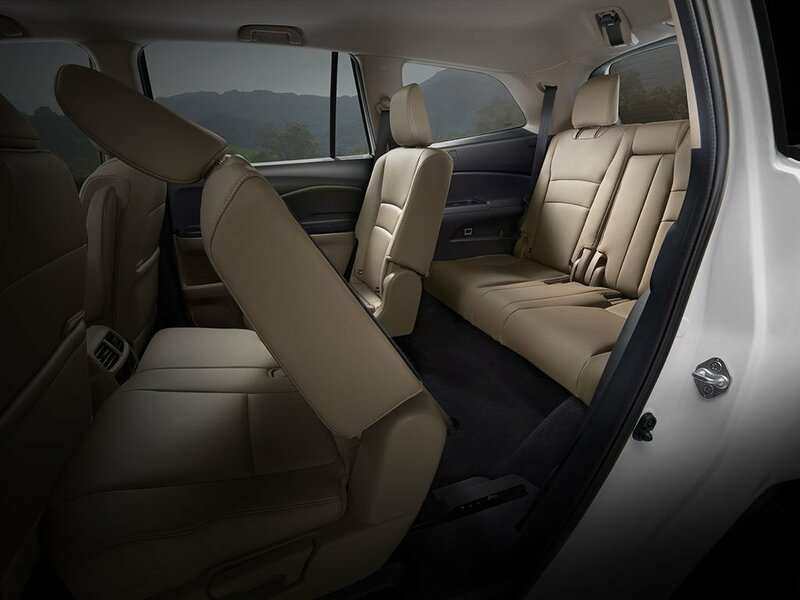 Elite comes standard with two plush 2nd-Row Captain's Chairs. 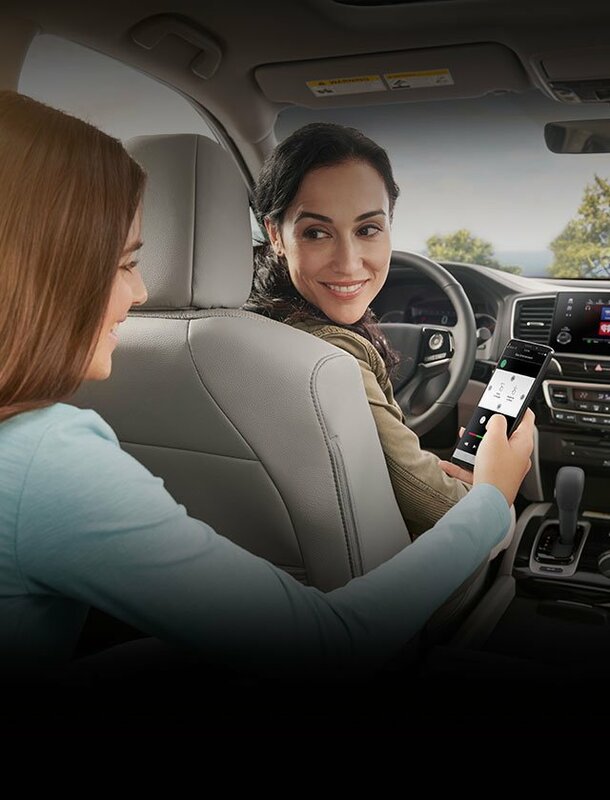 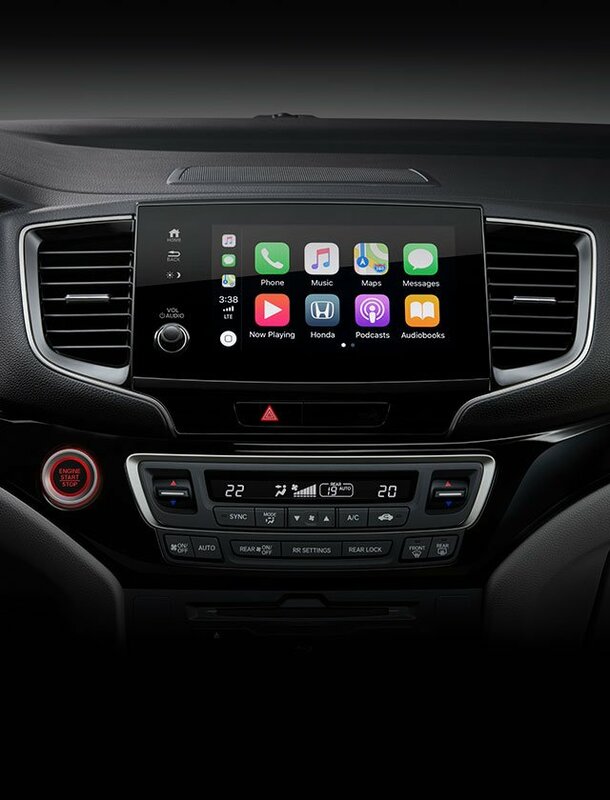 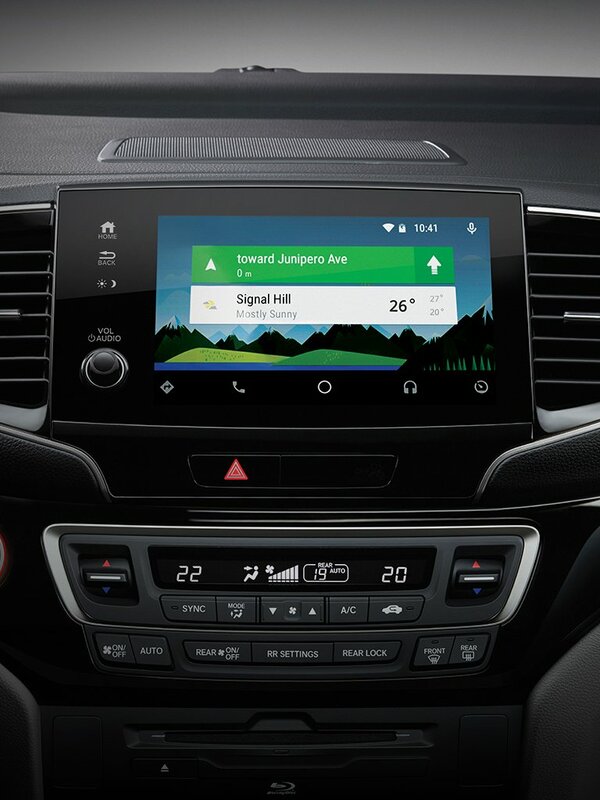 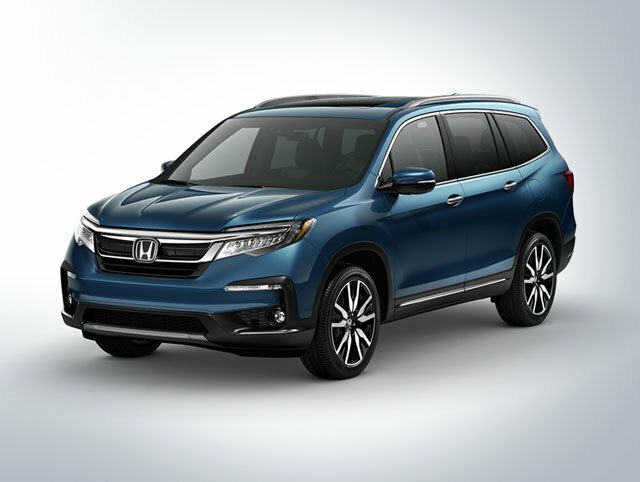 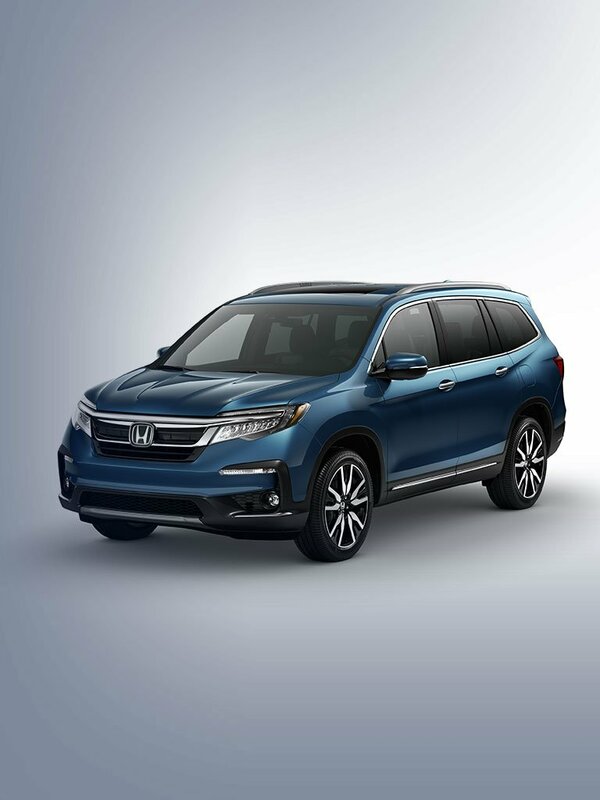 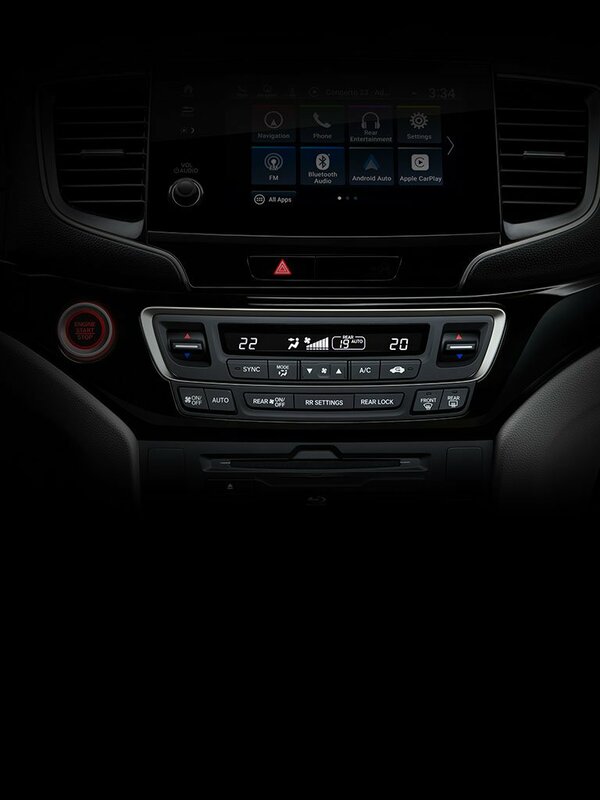 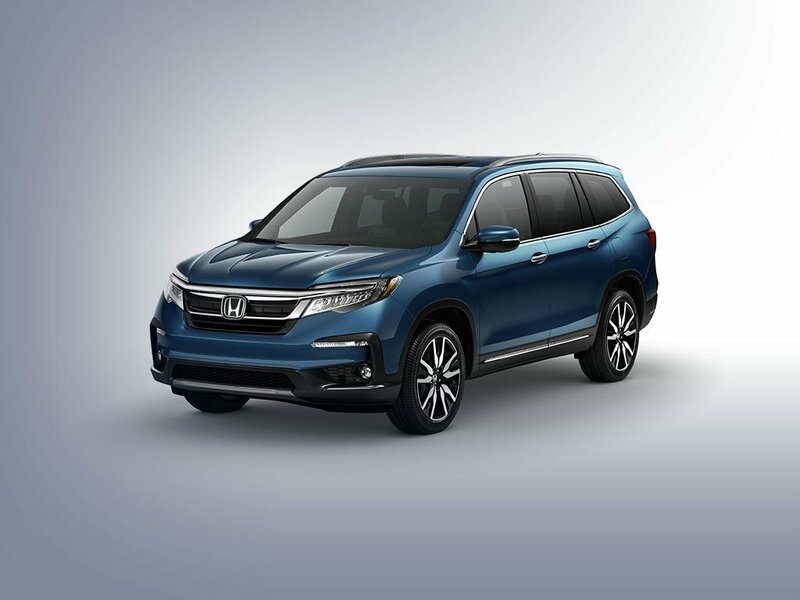 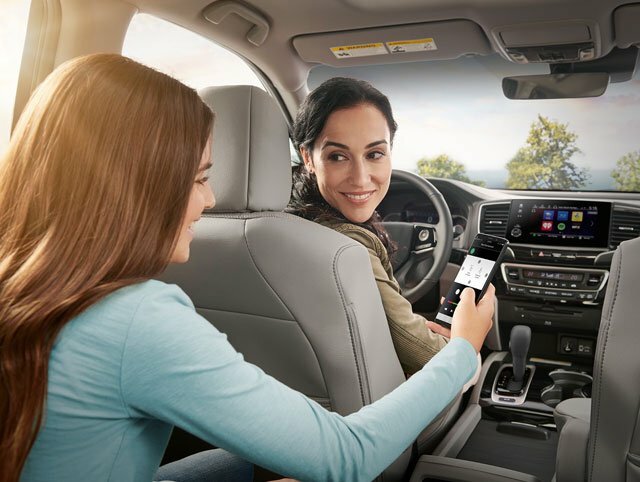 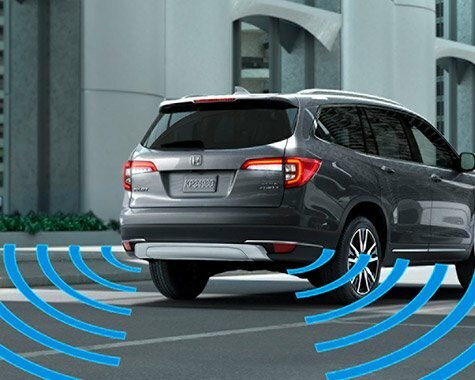 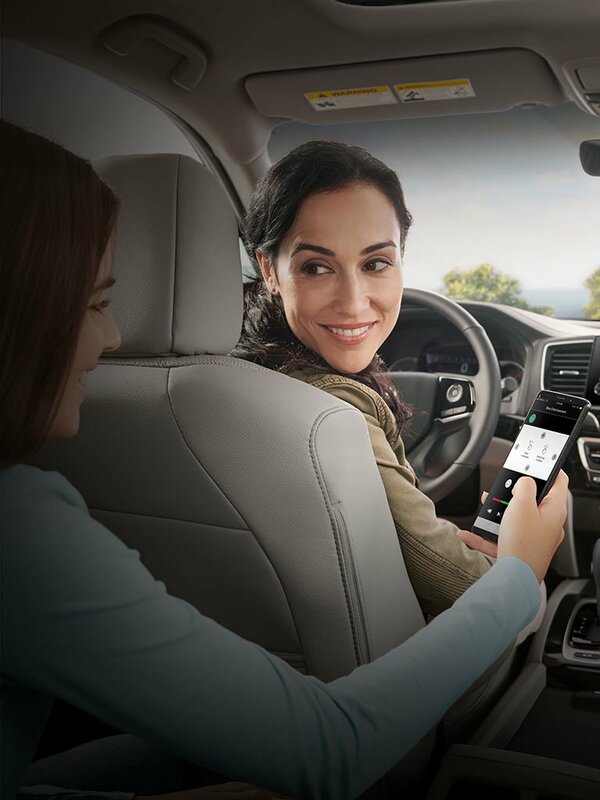 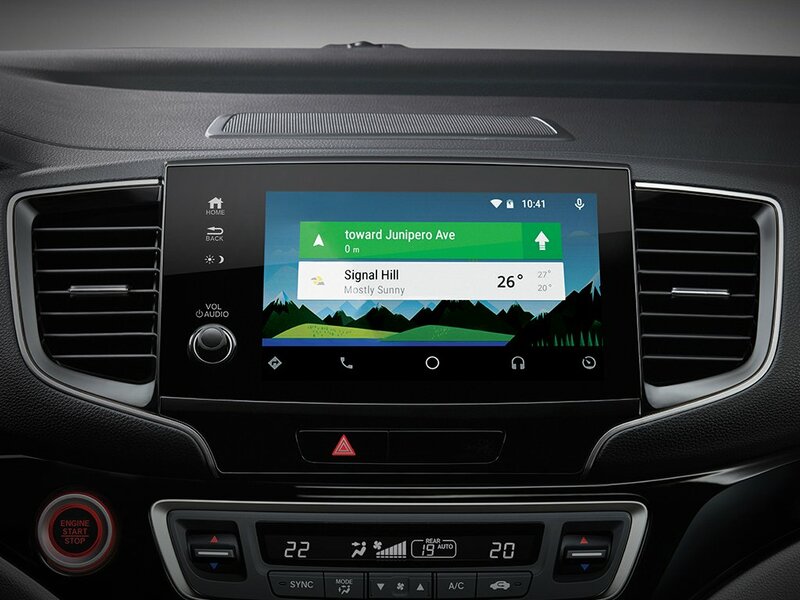 Connect your Honda Pilot with your compatible smartphone for directions, appointments and even the weather. 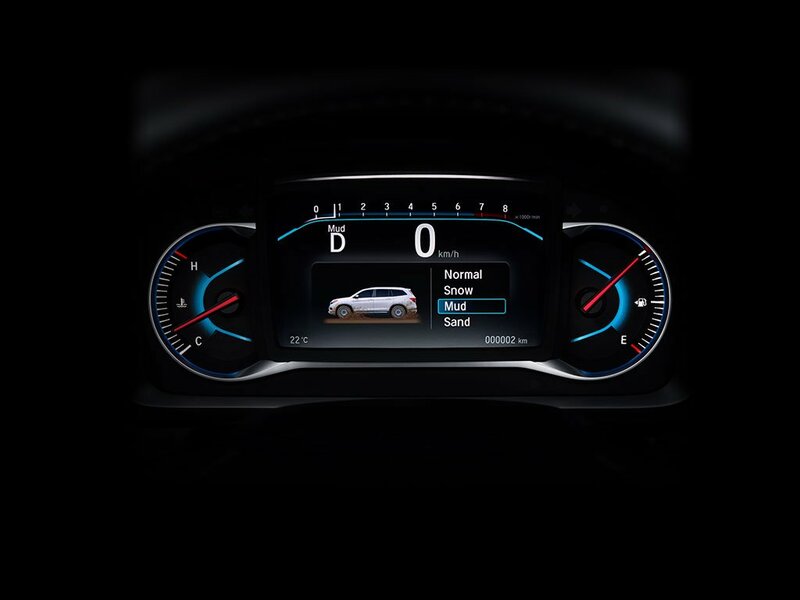 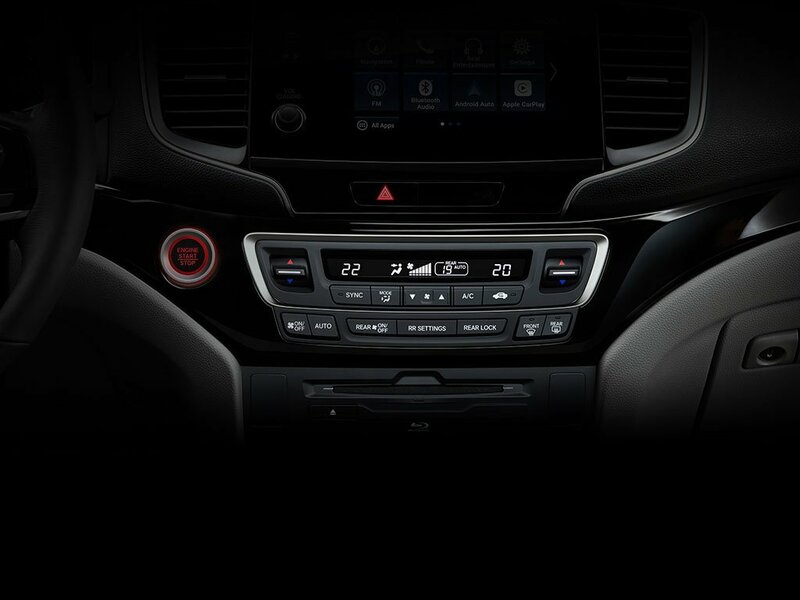 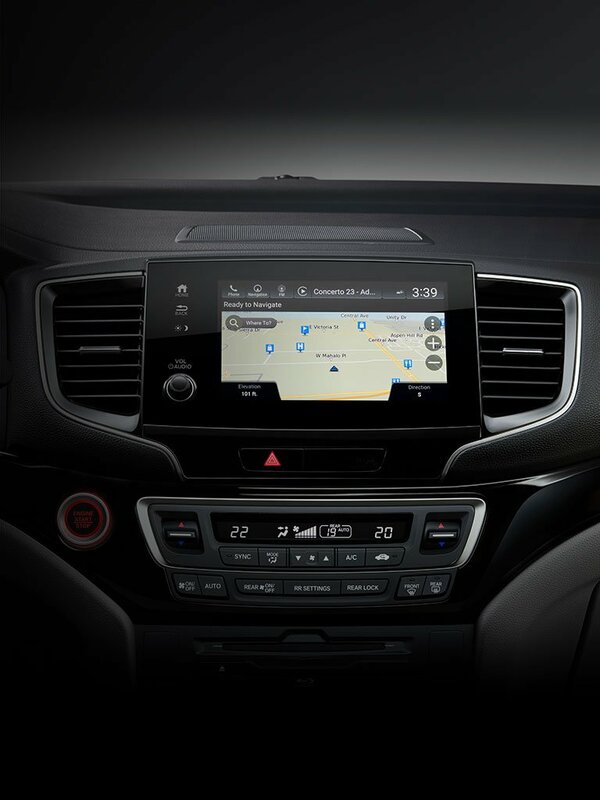 Advance capabilities are everywhere you look, including an available 8-inch Display Audio touch-screen. 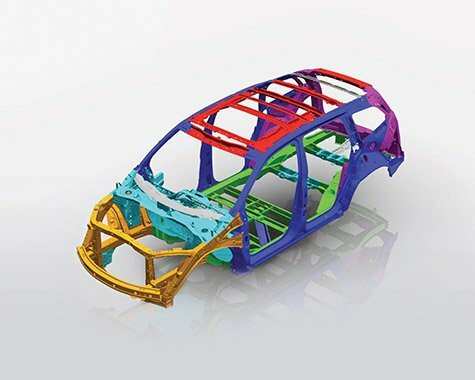 Smooth lines and an aerodynamic body complement our Earth Dreams engine and lighter chassis, making for a fuel-efficient Pilot. 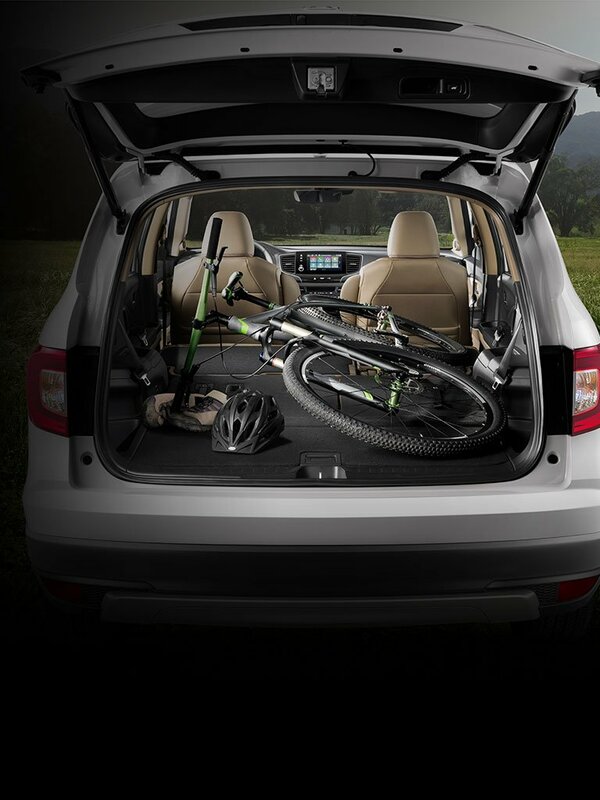 It’s breeze to load up for an adventure with the available Hands-Free Access Power Tailgate (Elite). 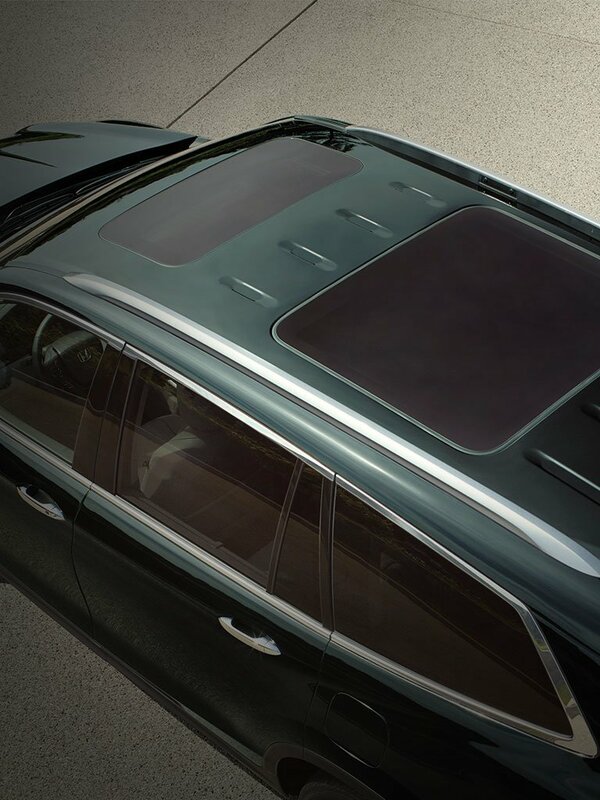 The sky’s the limit with two moonroof configurations – one lets you tilt and retract while the second, larger one gives panoramic views to the rear passengers (Elite). 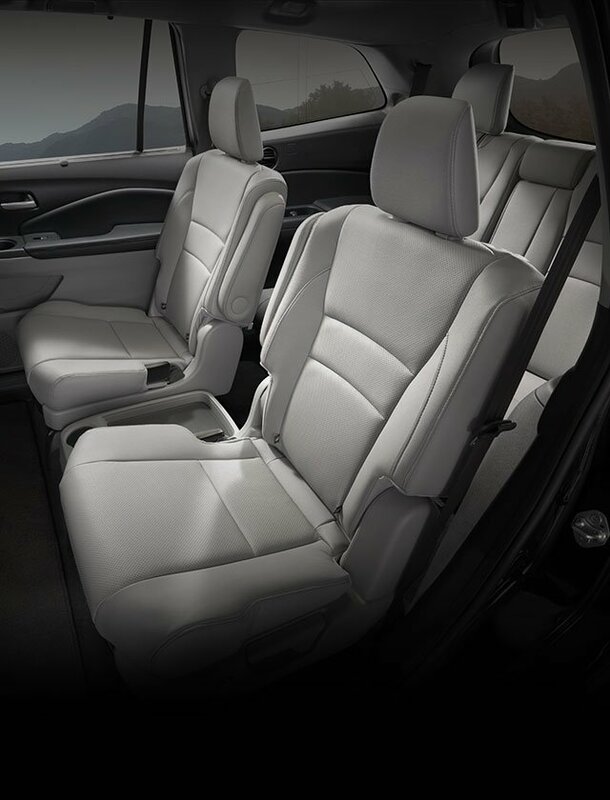 Available plush, comfortable 2nd-Row Captain’s Chairs mean your passengers can enjoy the first-class treatment (Elite). 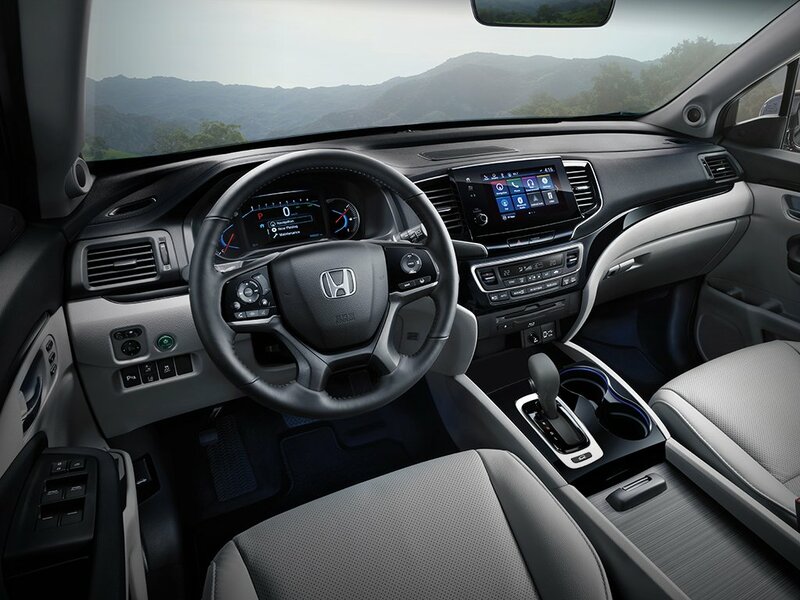 The dash and instrument panel have been enhanced with elegant touches like soft leather and fine double-stitching. 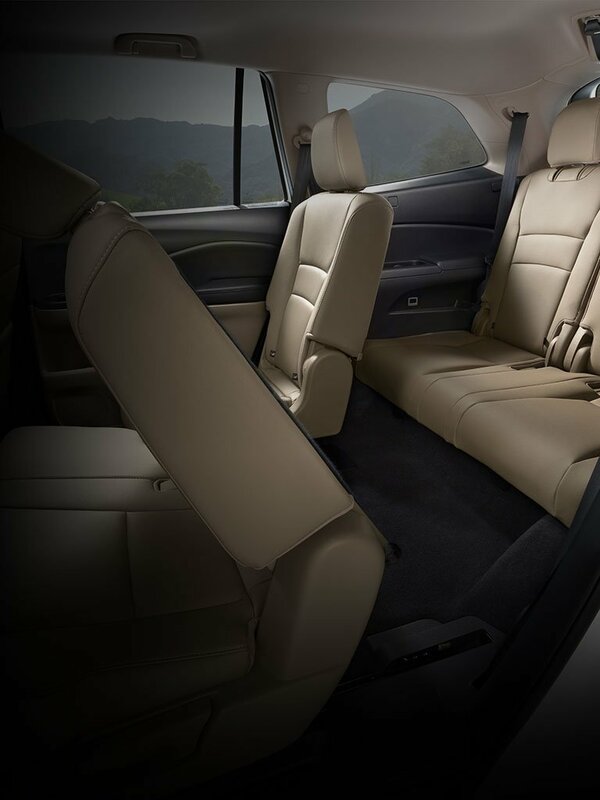 Enjoy available seating throughout the cabin for extra comfort. 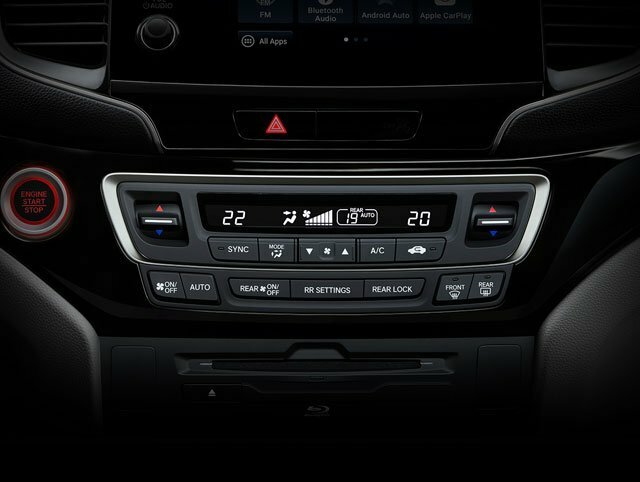 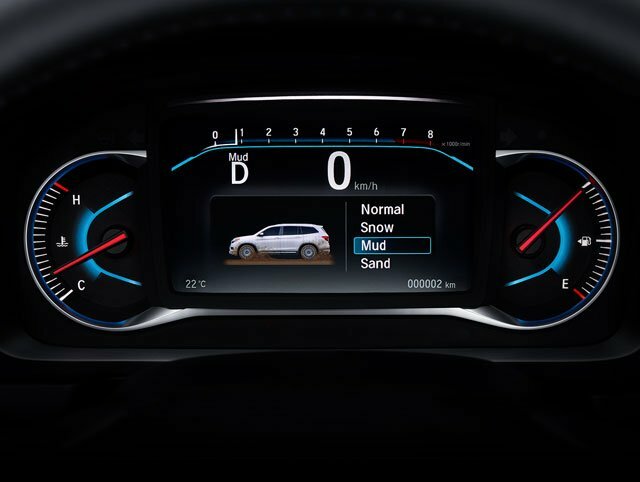 Keeping all your passengers comfortable is no problem with independently-adjustable Tri-Zone Automatic Climate Control. 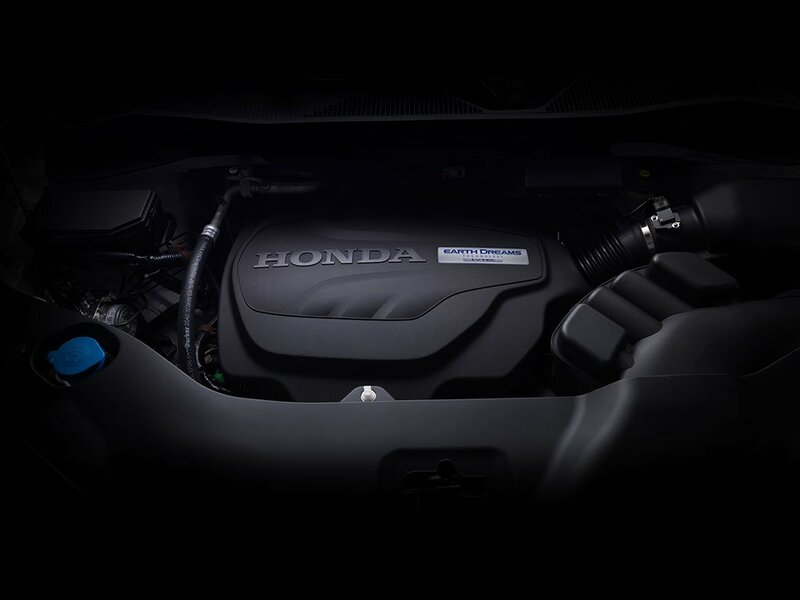 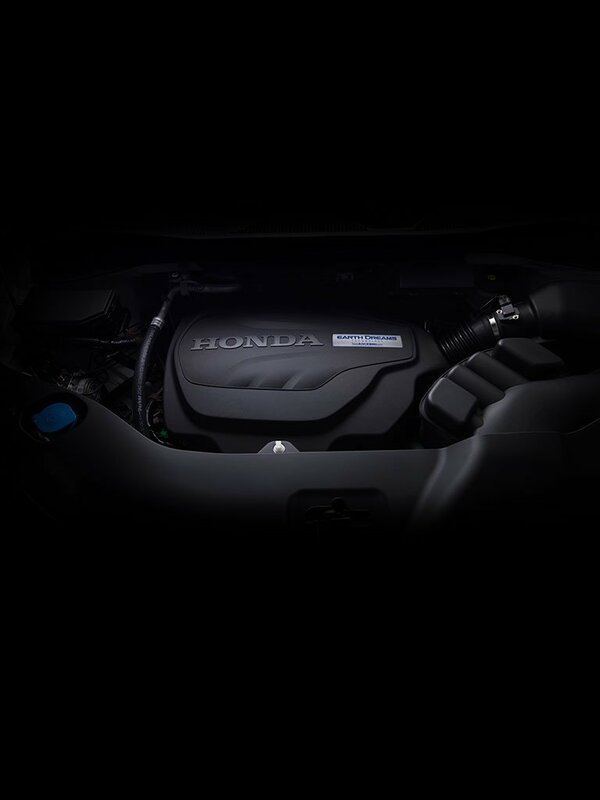 This powerful, direct-injected engine provides brisk acceleration and impressive fuel efficiency. 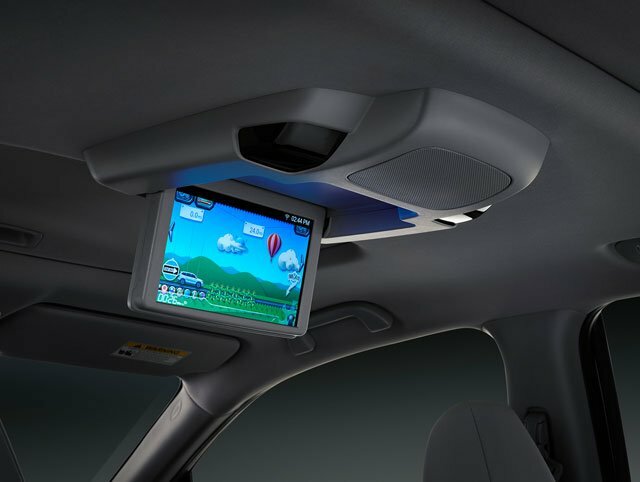 Pilot makes communicating with rear-seat passengers easy, using the available CabinTalk in-car PA system (Elite). 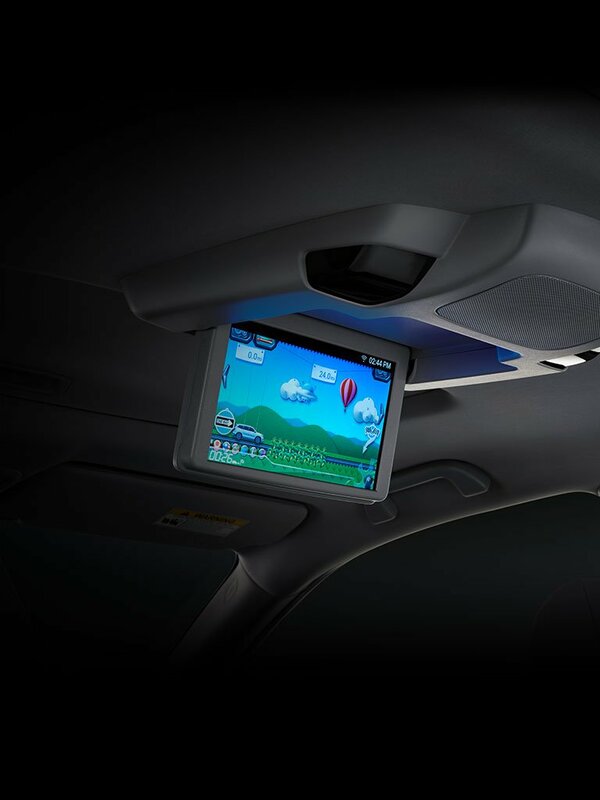 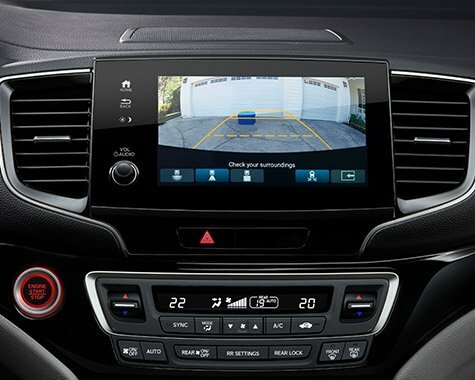 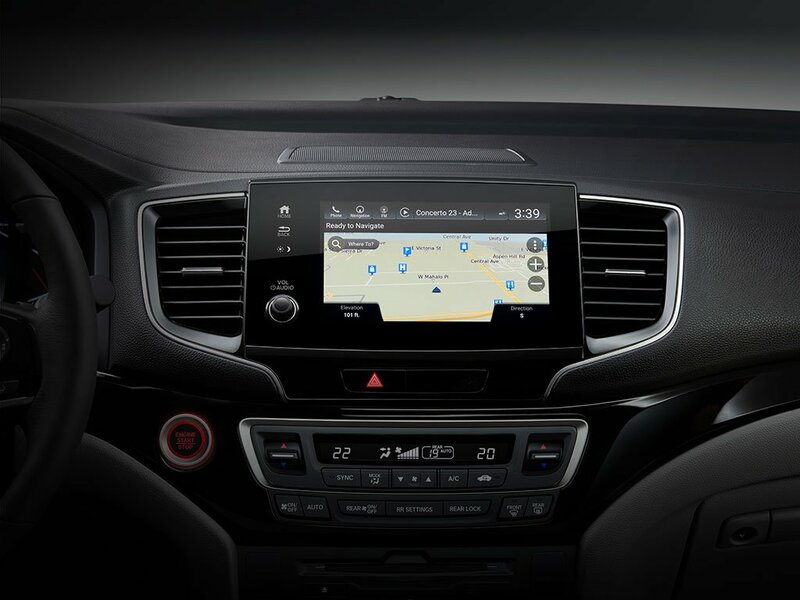 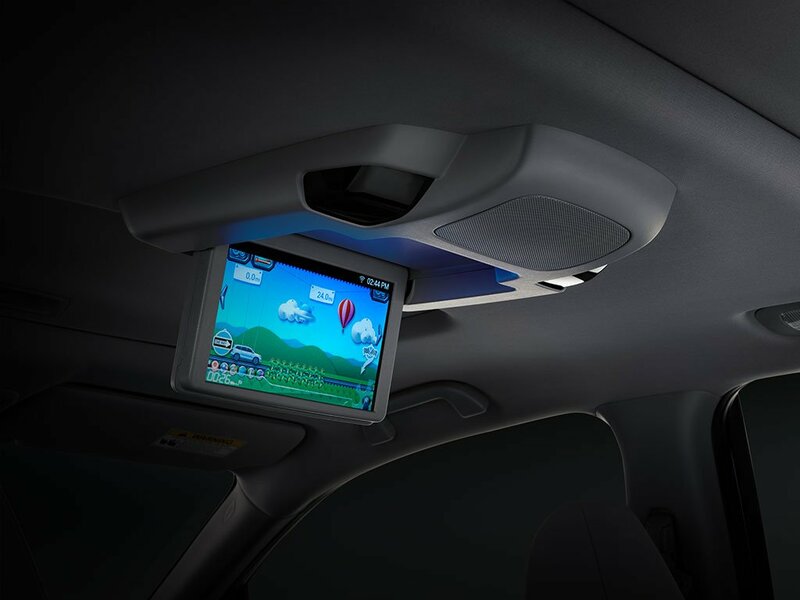 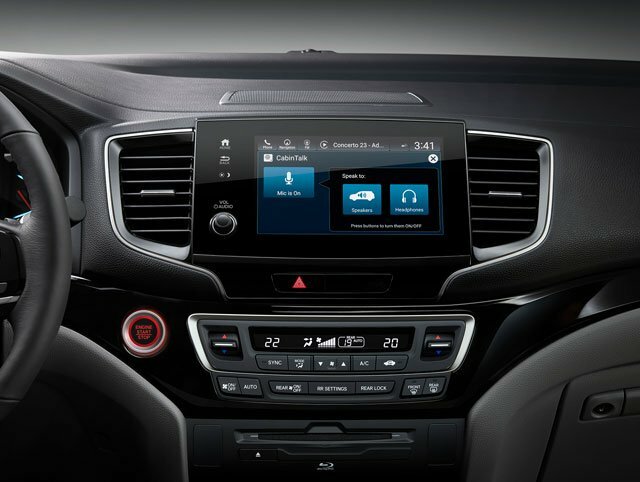 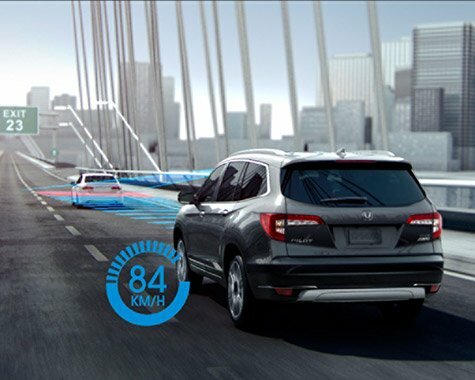 The available Honda Satellte-Linked Navigation System features 3-D renderings of terrain, buildings and road signs, as well as lane guidance (Elite). 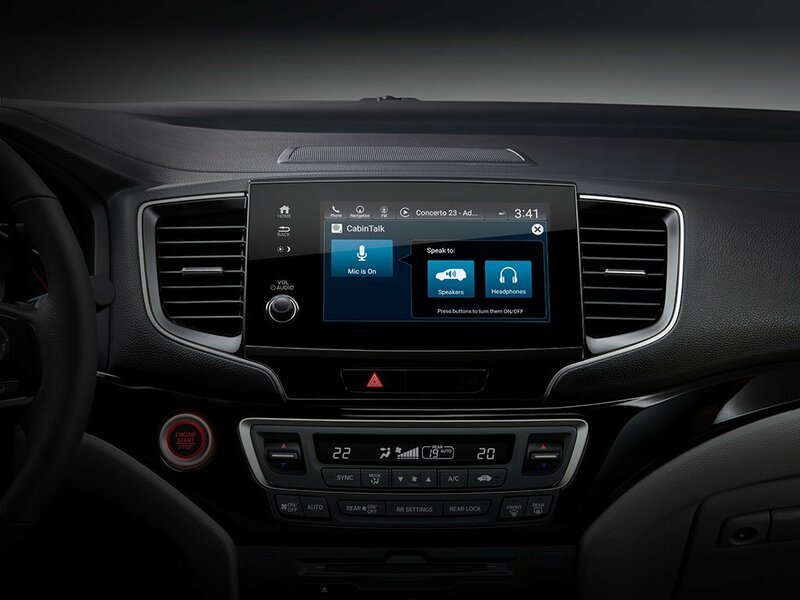 Enjoy streaming audio apps, DVD or Blu-ray discs (Elite). 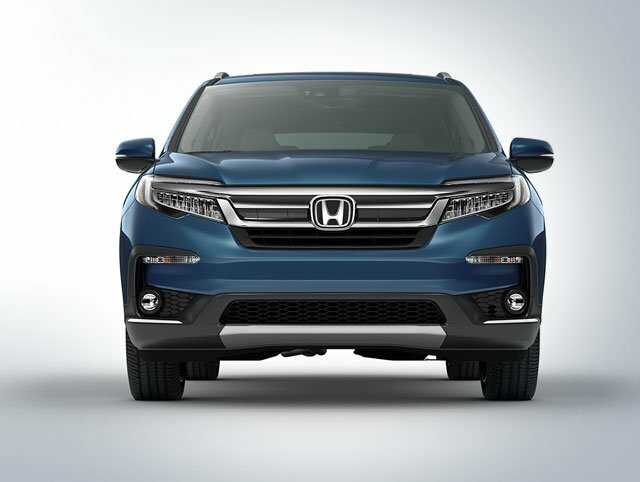 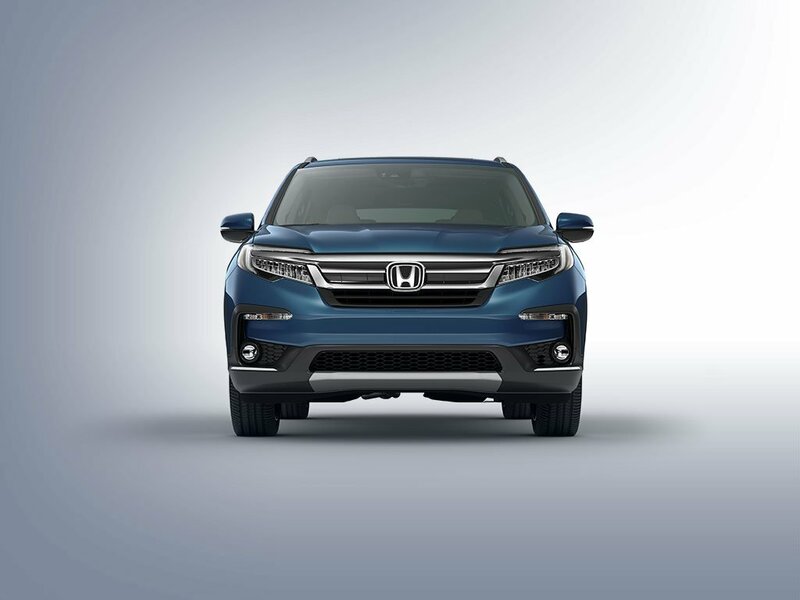 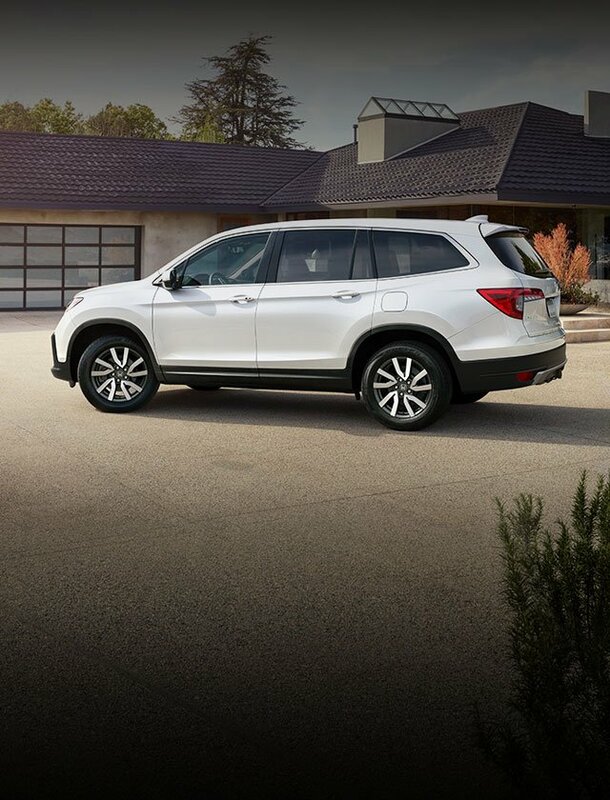 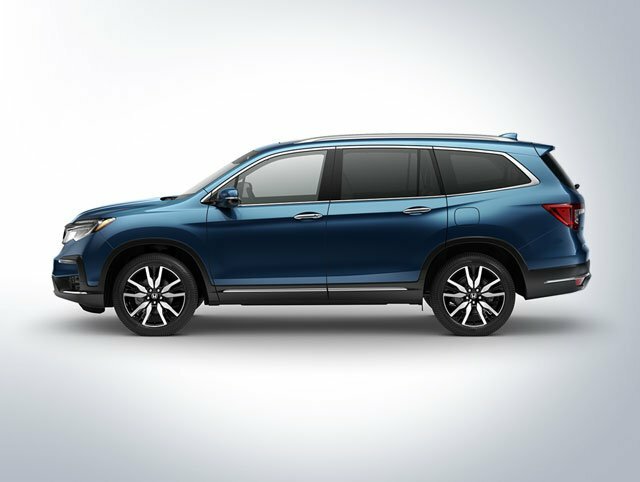 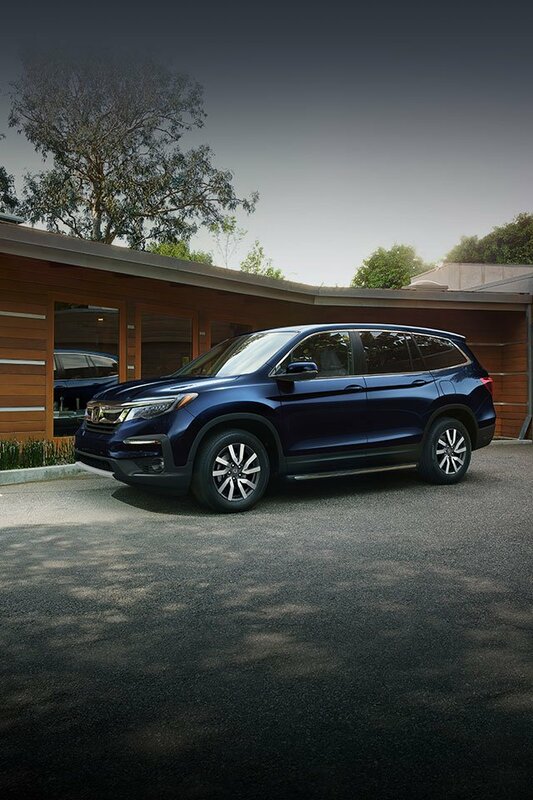 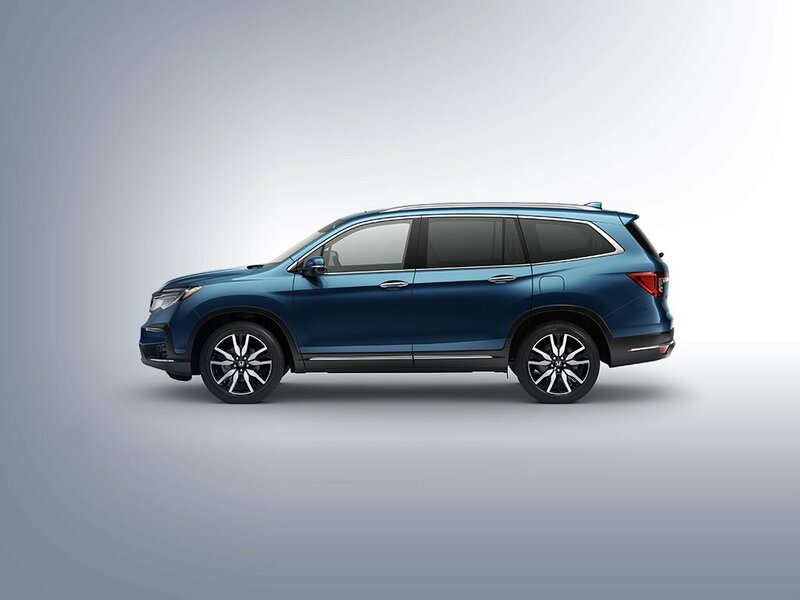 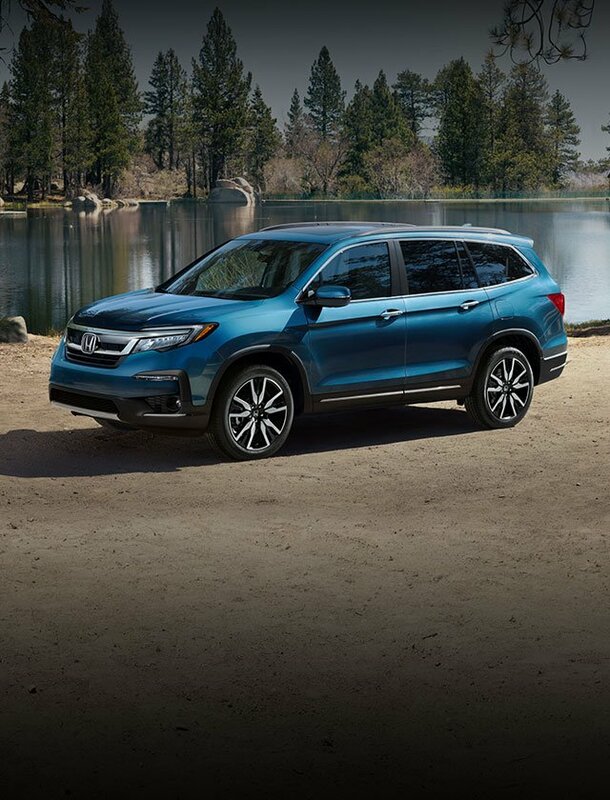 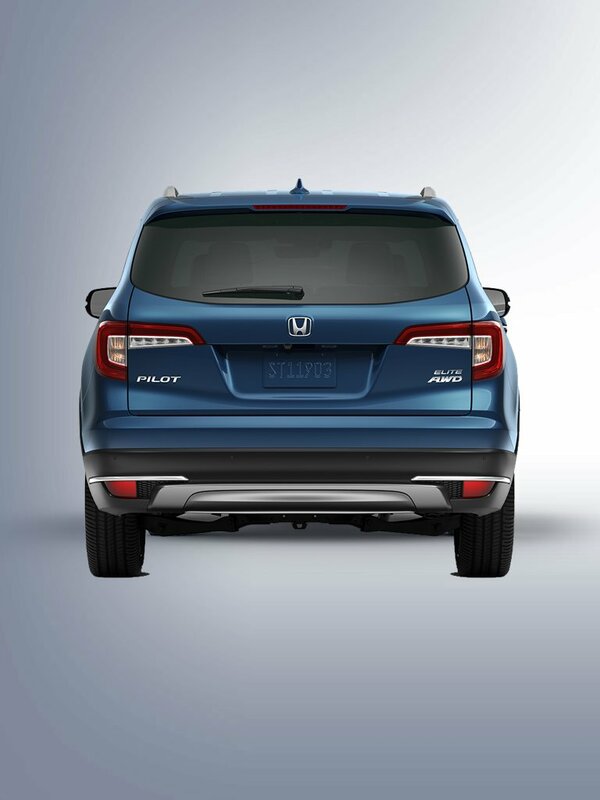 Standard in every Honda Pilot, so you can get a better view of what is behind you with three different angles: normal, top-down and wide. 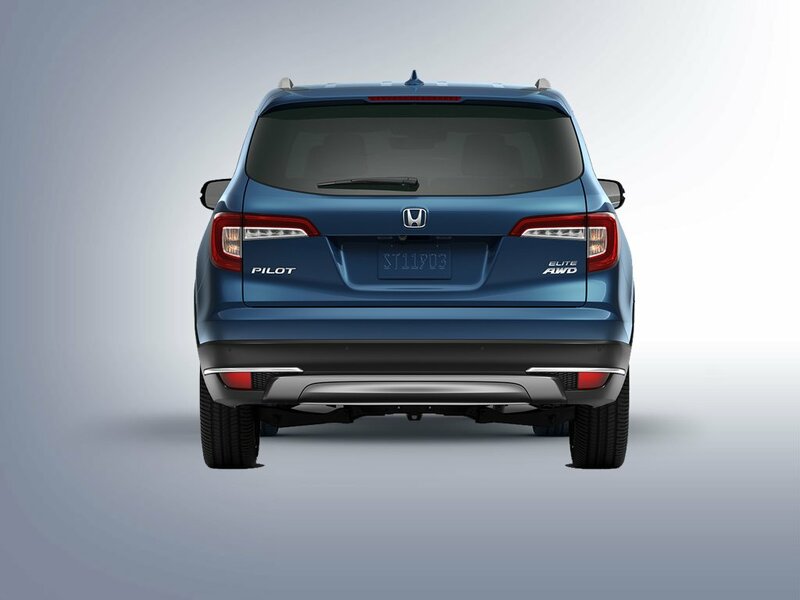 With sensors in the rear bumper to alert you when vehicles are detected, you’ll have extra help when deciding if it’s safe to back up (Elite). 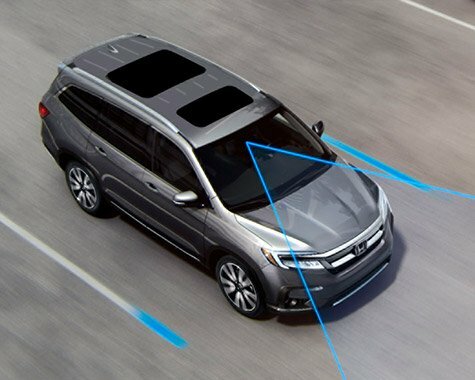 The Blind Spot Information System (BSI) uses sensors in the rear bumper to alert you when approaching vehicles are detected in an adjacent lane (Elite). 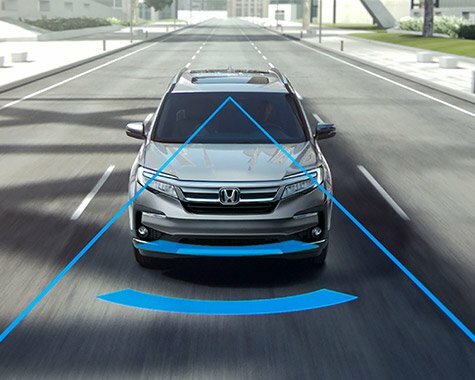 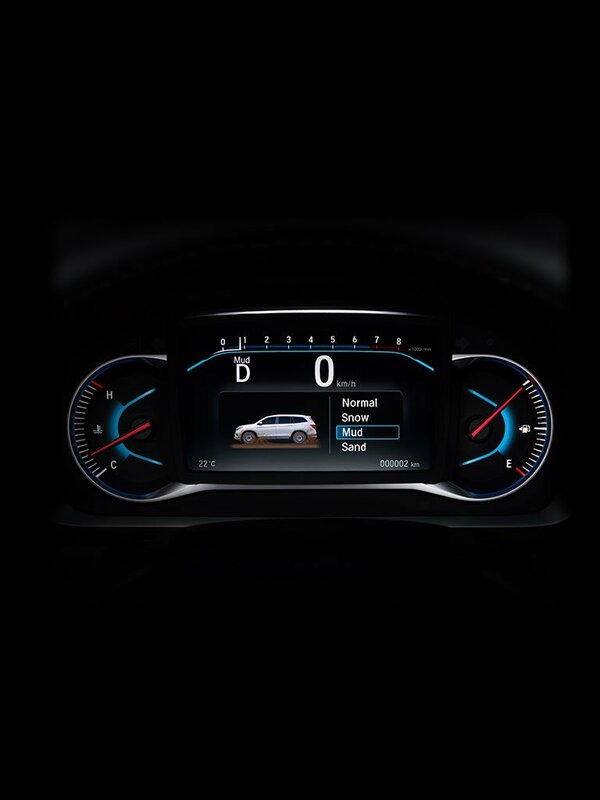 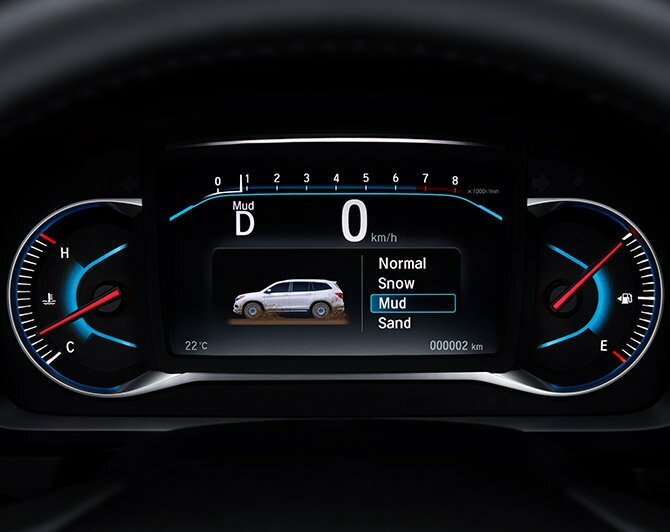 Adaptive Cruise Control (ACC) helps you maintain a set following interval on the highway, so you don't have to manually change your speed (Elite). 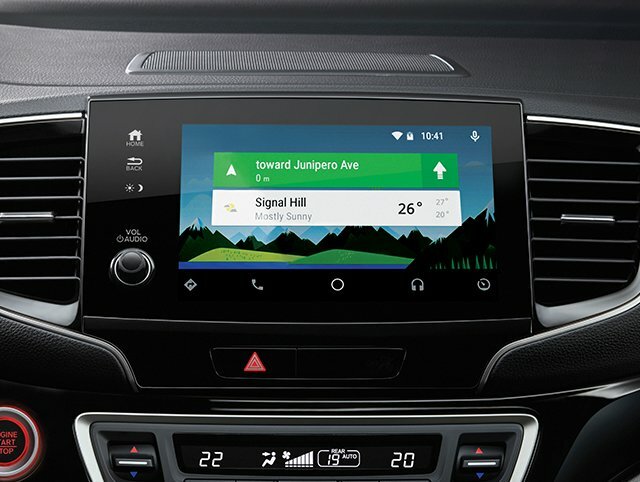 A small camera sees road markers, alerts you if you’re about to leave the road, and can take action to help keep you from doing so (Elite). 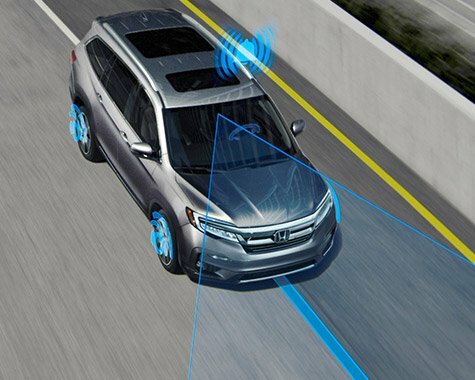 If your vehicle begins to stray from the center of a detected lane without signaling, the steering adjusts to help bring you back to the lane center (Elite). 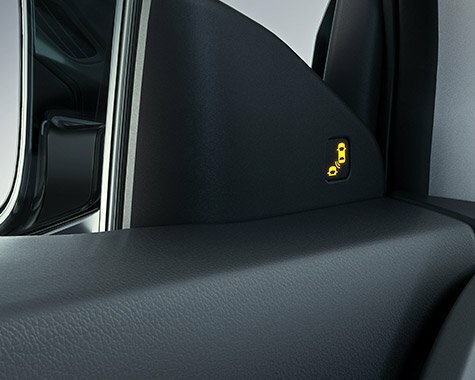 Helps brake the vehicle when it senses an otherwise unavoidable collision with a vehicle detected in front of you (Elite).